The land of Utah and the city of Salt Lake City are centered on the Mormon religion and their people. Before the Mormons arrived, there were the Native Indian tribes of Navajos and Apaches. There also the Shoshone, Ute, Piute and Goshute native people in Utah. The Spanish explorer de Coronado in 1540 crossed into the region. Not until the mid-1770s did Spanish missionaries attempt settlements in the region and to convert the Indians. American and several French trappers started coming to the region in the early 1800s. Utah genealogy begins with the Mormon pioneers in the 1840s. These pioneers to Utah originated from eastern states and had to continually move. Since their beginnings in 1830 they had been harshly treated by their neighbors, partially due to their religious beliefs. With ill treatment in Illinois, they realized they had to move to a new territory, separated from others. In 1846 plans for the migration of the large number of their members, their equipment and livestock were put together. It was their leader, Brigham Young, who had studied the little available information to determine that the Great Basin and the Great Salt Lake area would be the place for them. The first wagon train of pioneers set out across the Great Plains. It was a rugged and hazardous journey, including negotiating the passes of the Rocky Mountains. They finally arrived by July 1847 and were very pleased with this Salt Lake Valley. By December 1847, more than two thousand Mormons had completed the journey to the Salt Lake Valley. Several hundred, including Brigham Young, returned east to gather and organize the companies or groups scheduled for following years. The region was built from nothing, as irrigation systems were also needed in this dry land. Northwestern Shoshone Indians lived in the valleys on the eastern shore of Great Salt Lake and in adjacent mountain valleys and got along with the Mormons. By 1850 a proposed new state was presented to the U. S. Congress. From the lands of Utah and portions of Colorado, Idaho, Nevada, Wyoming, Arizona, Oregon, New Mexico and California, a state named ‘Deseret’ was offered. This was rejected by Congress. One reason for the rejection was the reluctance of Congress to grant such a large piece of territory to a state controlled and populated by Mormons. 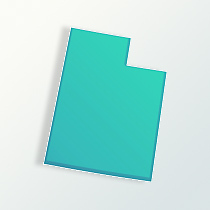 Instead Utah became a territory of the United States in 1850. The polygamous practices of the Mormons, which were made public in 1854, would be one of the major reasons Utah was denied statehood for the next 50 years. In 1860 the region had a population of 40,200 citizens. By 1890 it had reached 276,700 individuals. Most of the people emigrating were of Northern European ancestry; the Germans and from the Scandinavian countries. In the 1860s, minerals were discovered in the mountains and many miners immigrated to the area, especially from nations outside the United States. In 1869 the transcontinental railroad came to Utah. The railroad brought increasing numbers of people into the state, and several influential businessmen made fortunes in the territory. Statehood was officially granted on January 4, 1896, after they agreed to ban polygamy in Utah. Into the 20th century, the population continued to grow. In 1950 Utah had 507,800 citizens and in 2009 the population was about 2.8 million. The largest ethnic group are those of English backgrounds, roughly 35 percent of the total state when examining Utah genealogy. Those of Scandinavian nations represent 15 percent, German descent make up 12.5 percent and Irish is 6 percent. Many other ethnic groups are present in Utah, including Italians, French, Scots, Welsh and Swiss. African-American are 1.3 percent of the population and from Asian background about 2.1 percent. The Church of the Latter-Day Saints, the Mormon religion, is the dominant faith in Utah. Approximately 58 percent are Mormons. The next largest group represent the various Protestant religions. Besides tourism for the scenic wonders of the land, Utah has petroleum refining done by a number of oil companies. In central Utah there is coal production along with cattle ranching. Other minerals mined include copper, gold, silver, molybdenum, zinc and lead .